Editors The Exontrol's ExEditors Library, contains 16 data edit controls. Each editor can have a three-state check box associated and an unlimited number of buttons on the left or right side. Each button can display an icon or a picture and can have its own tool tip. Most of the editors are mask based. Exontrol's new exRecord control is a container component that displays a set of editors added manually or bounded to a table in a database. The exRecord name comes from the record, that's a set of fields that contain related information, in database type systems. The exRecord significantly reduces development time of data components. It includes editors like: mask, date, drop down list, check box list, memo fields, spin, slider, OLE Object viewer, color, buttons and more. Details here. ActiveX hosting (you can place any ActiveX component in any field of the control). Arranging fields from left to right, from top to bottom or custom layout as well. Ability to load icons and pictures from BASE64 encoded strings. ANSI and UNICODE versions available. eXG2antt The Exontrol's eXG2antt component is an editable tree-grid component that includes Gantt chart features. The ex(G)rid-ex(G)antt, shortly exG2antt or ex2Gantt, combines the exGrid and exGantt components in a standalone component. The exG2antt library lets the user changes its visual appearance using skins, each one providing an additional visual experience that enhances viewing pleasure. 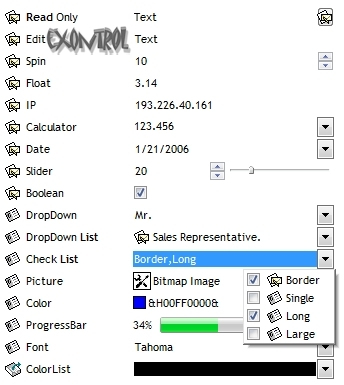 eXMLGrid Exontrol's new eXMLGrid control provides an innovative grid view look and handles data in XML fashion way. It provides swift and robust performance and a wide range of formatting features never seen on other grids. The eXMLGrid component can be seen as a generalized tree control that allows resizing the node's indentation at runtime. The eXMLGrid component lets the user changes its visual appearance using skins, each one providing an additional visual experience that enhances viewing pleasure. Skins are relatively easy to build and put on any part of the control. eXEditors The Exontrol's ExEditors Library, contains 16 data edit controls. Each editor can have a three-state check box associated and an unlimited number of buttons on the left or right side. Each button can display an icon or a picture and can have its own tool tip. Most of the editors are mask based.